The finished product. Ta da!! Brad and I enjoyed a lovely breakfast this morning at BLD. Brad ate most of his “Hatch Hash,” but left virtually untouched a small pot of chorizo queso. Before the waiter could whisk it away, I got it safely packaged into a to-go cup. I have no idea of the chorizo’s ultimate destination, but in the next few days, it will add some spicy richness to some lucky dish–likely a soup or stew. This is my normal way of cooking. I tinker. I use leftovers. I don’t use recipes as designed—but instead refer to several in combination as brainstorming tools. I’m a big fan of peering into the fridge and pantry, then Googling the names of several ingredients (e.g., quinoa, spinach, pumpkin), seeing what comes up, and creating a unique concoction from there. In other words, I’m a kitchen bricoleur. Bricolage, French for “tinkering”, refers to the practice of creating work by pulling from a diverse range of materials that just happen to be available. My cooking is like my research. I rarely begin my projects with crystal clear purposes or instructions. Instead, I look around and see what’s available—adding a little of this, a little of that, tasting, and then modifying as I go. This works great for ~75% of what I cook and so-so for the other 20%. Every once in a while, it completely flops. My method stands in stark contrast to that of my love, Brad, who starts with a recipe, purchases the proper ingredients, and follows the instructions. Brad, by the way, has a much higher yumminess success rate. But, it also costs more money and requires more up-front planning. Anyway, this week, I wanted to make cheesecake. 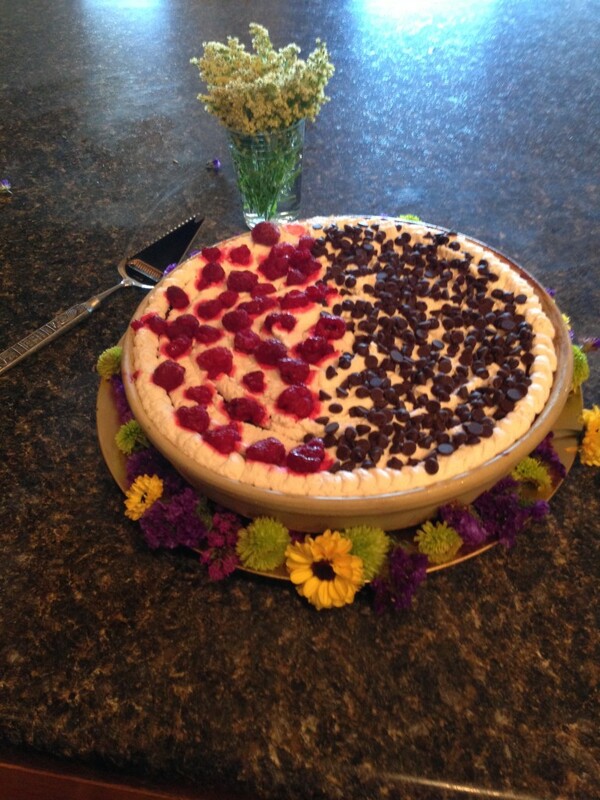 And cheesecake is a chemistry project. 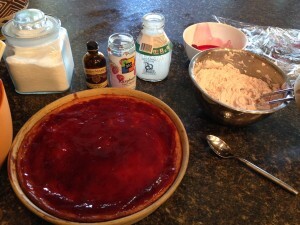 Bricolaging it in my traditional manner was not going to do for a cheesecake. Therefore, and completely against my nature, I studied a recipe. Then I went shopping. Then I actually FOLLOWED the recipe. Okay, maybe not exactly, but mostly. And the result was, by all accounts, pretty dang successful. 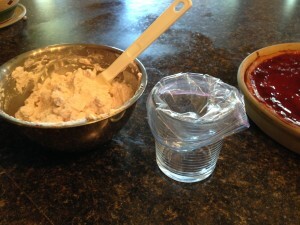 Here, I provide a step-by-step of the process—as unlike most my cooking, this process can actually be replicated. And, the process has also inspired some philosophical reflections (feel free to skip the next three paragraphs if you want to get right to the baking). First, I think we could learn a lot about people’s research inclinations (deductive/scientific/positivist vs. inductive/humanistic/interpretive) by asking them how they usually go about cooking. And, we might be able to learn something about trying to cook in the opposite way than our nature. I’ll never give up my bricolage ways. 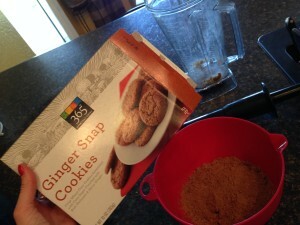 However, this week, I definitely felt the advantages of baking with a recipe and set of instructions in hand. Doing it this way gives me a little insight into the advantages of a clear purpose, a priori research design, and being able to repeat the process! Second, there are clear benefits of living with someone like Brad who has the opposite cooking style. Between the two of us, we have a great mix of good old reliably yummy dishes (from Brad), and decent dishes that creatively use up the leftovers (from me). Maybe we could usefully view the research field the same way, and rather than engaging in the same old tired paradigm wars, see how different styles complement (and need) each other. Finally, it’s no coincidence that it’s only on sabbatical that I baked a cake – where I have time and space to experiment, check and double check my work, and risk error without awful repercussions. It reminds me that giving myself space and grace for potential failure is a catalyst for feeling courageous enough to try new things. Don’t have a spring form pan and this worked well. Anyway, enough philosophizing, here’s the run-down on the cheesecake. I began with a low-sugar recipe available here. I made a couple modifications. 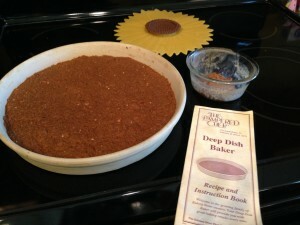 First, I added a ginger snap crust available here. Further, I only added 2/3 of the Spenda called for. Also, I didn’t have a spring form pan, so used a “deep dish baker” from Pampered Chef that my step-mom Judi got my years ago. 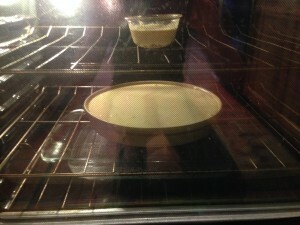 I also added a pan of water at the bottom of the oven (adds humidity so the cake doesn’t crack). Finally I swapped cream cheese for lower fat Neufchâtel. Otherwise, I followed the instructions. Mixing everything just right, with ingredients at proper temperature and lemon from our back tree. 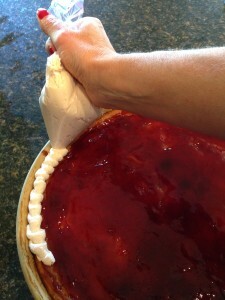 The next day, I topped the cake with raspberry jelly, first heated in a pan and then poured on top. I placed the cake into the freezer for a few minutes to firm it up. 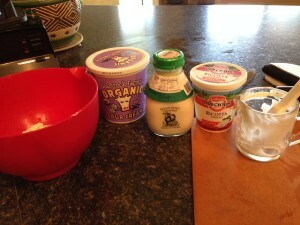 Then, I whipped my own heavy cream, adding a couple tablespoons of Splenda and a teaspoon of Vanilla. I placed the whipped cream in a Ziploc baggy, took the cake out of the freezer and piped it onto the top. Then I topped half the cake with Truvia sweetened dark chocolate chips and the other half with raspberries. Trying to be artistic with a modified Ziploc bag. 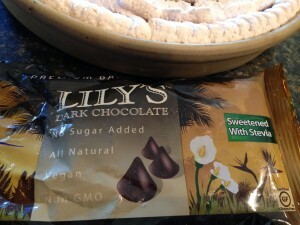 Stevia dark chocolate. Expensive but worth it! Since I couldn’t decorate the sides of the cake, I decorated the platter with flower cuttings. 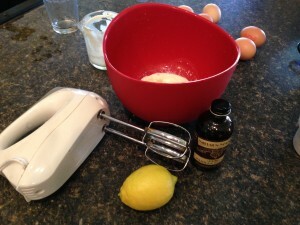 I hope this inspires you to try out the cake or another cooking style. Let me know how it goes, and feel free to post any questions. Hmm. Well, you know me, so you know that I’m not a positivist. However, I apparently cook like one because I do follow recipes. I’m also one of those people who will not begin playing an unfamiliar board game before thoroughly reading the instructions. Perhaps we should introduce personality type into this conversation. Myers-Briggs-wise, I’m an INTJ, and we are not known for our spontaneity. I like to know exactly what I’m getting into before I get into it. Here’s another example. The first night at NCA, my roommate (Janet J.) is looking through the program book to decide which panels she will attend. Me? I already did that at home, creating a schedule for the entire conference. I’ve also Googled where all walkable coffee houses and bookstores are. So, yeah, I couldn’t do anything creative with leftovers if you paid me. HI love your comment Tristan! Indeed, there likely is a lot more going on here. It’s funny, I tend to be really organized, yet there’s something in me that gets great satisfaction from “using up” things. I also like to use up every single space that I have in packing a bag (which sometimes means that I look wistfully over to a friend who has more space and think, boy, you could have packed something else in that space).